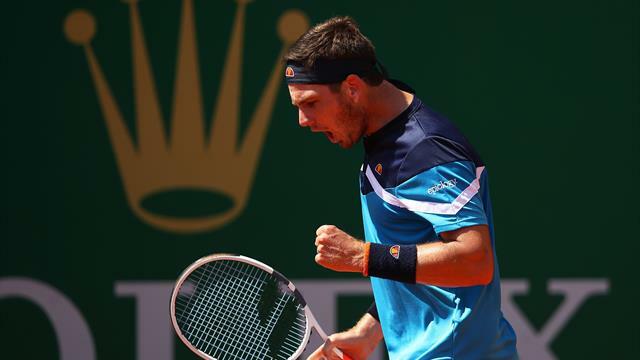 Cameron Norrie is closing in on the British number one ranking after reaching the quarter-finals of the Monte Carlo Masters. Norrie, 23, struggled in the opening stages of his clash with Hungary’s Marton Fucsovics as his opponent broke early and raced into a 3-0 lead. However, he dug deep and rebounded to force a tie break, that he eventually won in order to take the opening set. Norrie dominated the second set as broke twice on his way to sealing a 7-6(3) 6-3 victory. It is a remarkable performance from Norrie given that 14 months ago he had never played on clay. He is closing in on a ranking in the 40s, a new career-high, which would put him top of the British ranking and put him in position to choose the Davis Cup captain later on in the year. Norrie will face Italy’s Lorenzo Sonego for a place in the semi-finals. Elsewhere defending champion Rafa Nadal produced a claycourt masterclass to pick apart fellow Spaniard Roberto Bautista Agut 6-1 6-1, as the world number two began his title defence in stunning fashion on Wednesday. "I've had some great moments on this court, I really enjoy playing here." "I've been training well but haven't been able to take that into matches." "I live just 500 metres from here, I'm comfortable on this court. I'm starting to feel better about my game. I'm really ready for the clay season."